Retake Fort Snowhawk for the Imperials. Hjaalmarch Imperial Camp, Fort Snowhawk. Note: This quest only becomes available if you give Hjaalmarch to the Stormcloaks during Season Unending. Report for duty to Legate Rikke at the Hjaalmarch Imperial Camp. Join the Legion soldiers gathering for the attack. When speaking to General Tullius he will make a bitter comment about your decision to give up Hjaalmarch during Season Unending. He will then direct you to Legate Rikke at the Hjaalmarch Imperial Camp. She will give you orders to rendezvous with a group of Imperial soldiers preparing to attack Fort Snowhawk and to assist in the assault. Make your way to Fort Snowhawk. 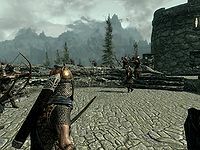 The fort is located a small ways west of hold capital Morthal, and the soldiers are waiting just southwest of the fort. As you approach the group, they will draw their weapons and attack the fort. Assist your fellow soldiers in clearing the fort of Stormcloak rebels while the game updates you with the percentage of enemies remaining. The battle takes place in the exterior parts of the fort only, in the courtyard and on the walls. Once you have killed all Stormcloak rebels, the quest will be completed. The Reunification of Skyrim quest will update and prompt you to return to General Tullius to report your success and receive your reward. Corpses will disappear shortly after death, so you may wish to loot them as you go to avoid missing out. 10 Legate Rikke has sent me to assist in taking Fort Snowhawk from the enemy. 9000 Finishes quest We have succeeded in taking Fort Snowhawk from the enemy.